1st row (L to R) Leslie Jacobi & Dan Siraco of TD Bank; Clino Diorio of the Italian National Club; Missy Miller Republican Candidate NYS Assembly 20th District; Rino DeGennaro, of LaTerrazza Restaurant, Susan Clayton, Alicia Huertes & MaryAnn Risorto of New Horizon Counseling Center. 2ndt row (L to R) Dr. Julio Novello, DDS, John Teramo, 5 Towns Kiwanis, Giovanni Soto, of Leonardo DaVinci Lodge #2385, Cedarhurst Trustee Ari Brown; Chris McGrath Republican Candidate for State Senate; Cedarhurst Mayor Benjamin Weinstock; Jeff Beja of Central Galleries; David “Bull” Gurfein Republican Candidate for State Senate; Anthony Eramo, Democrat candidate for NYS Assembly primary; Joe Tamburino from Tamburino’s Deli; Ponte Teramo, 5 Towns Kiwanis. 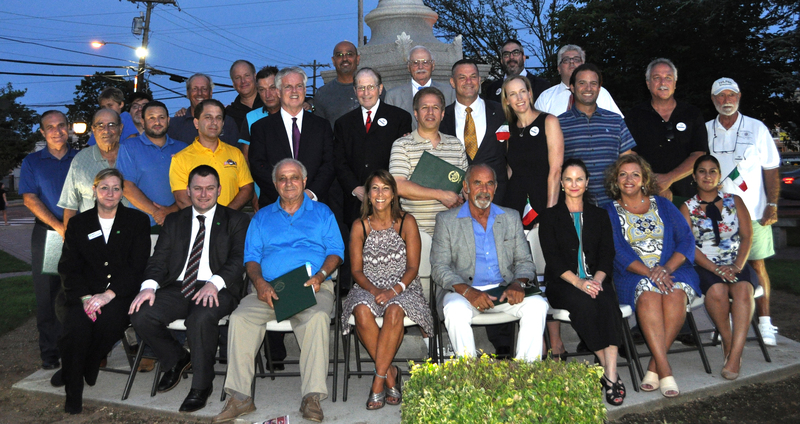 3rd row (L to R) Tom Cohen & Anthony Campanile, of 5 Towns Kiwanis; Benny Parise, Italian National Club; Sal Cimato, Santa Marina Society, Cedarhurst Deputy Mayor Ronald Lanzilotta; Cedarhurst Trustee Israel Wasser and Village Administrator Salvatore Evola. The sounds of the Italian classics filled the air at Andrew J. Parise Park on Tuesday night as the audience sang along to a captivating performance by Moreno Fuzzetti. The crowd was chanting “Bravo” as the man with the golden voice dazzled the audience. Earlier in the evening, “Magic at its Best”: Pat Darienzo amazed the crowd with his unique humor and magic show. During the show 3 lucky children were selected from the audience to be magicians for the evening. TD Bank, New Horizon Counseling Center, TheFiveTowns.com TOH Supervisor Anthony J. Santino, TOH Councilman Bruce Blakeman, Cedarhurst Republican Committee – John Novello, Central Galleries, Cimato & Son Nursery, A. Montilli Plumbing & Heating Corp, Burnside Collision & Towing, JKJ Computer Services Inc., Five Towns Kiwanis Club, Italian National Club of Nassau, Tamburino’s Deli, Dr. Julio C. Novello DDS, Santa Marina Society of OLGC, Leonardo DaVinci Lodge #2385 and La Terrazza Restaurant. Mayor Weinstock reminded everyone that our sponsors play a vital part in making these free concerts available at absolutely no expense to our taxpayers. Please join us on August 16th at 7:00 PM for our Jewish Music Night as Gourmet Glatt, puts on another spectacular show with the most talented performers. First, for the Pre-Show, we will have BeatBox Duo, with Ilan and Josh who will delight you with their unique “beats” and style of singing. They are now on America’s Got Talent and they received the 4 yes’ to the next level. Starting at 8:00 pm, see and hear The Gat Brothers, who are coming all the way from Israel to perform. They are a sensational hit in Israel – and here too. You will be thrilled by their outstanding performance. This is a concert you do not want to miss! Our Park is open to all. Come and cool off in our Water Park. Slide, climb, swing and explore the wonders of our playground, and then settle down and have a picnic lunch. There’s lots to do in Cedarhurst! Come and find out! !